I talk about ways I have in the past and continue now to control the amount of time my kids spend playing video games and watching TV, etc. I share that I really like using Safe Eyes for an Internet filter, but there are other options available. I also find that Kids In Mind is a handy tool for screening movies before allowing our kids to watch them. But no system is perfect! We need to be having ongoing conversations with our kids about the media and what our Church teaches about human sexuality and dignity. Prepare yourself for having those important conversations with your kids! Theology of the Body resources are a great tool for parents in having these important conversations (and no, I did not know that my book was listed at the top of this page when I decided to link to it — funny!). We moms need to control our own consumption of media and make smart choices about the kinds of movies we will watch, TV shows, music, and social media. 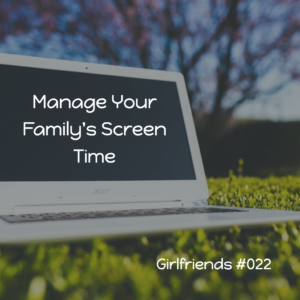 How do you plan to limit your own screen time this summer and fully engage in your family relationships? This week I share a fun conversation I had with Kate Wicker, my hilarious and humble friend who shares from the heart about messes, mayhem, and motherhood, as well as how we talk about our bodies and maintain good health. Kate shares some of her personal challenges and triumphs and the ways in which running and learning to care for her body have been part of her success. I share feedback from listener Catherine who wrote from Canada to say that she enjoys the podcast, as well as others who have emailed and left reviews for the podcast on iTunes. If you would like to leave a review and subscribe on iTunes, I would be so grateful! As always, I am so grateful for your presence here. God bless your week!